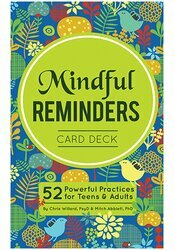 Live your life more fully, reduce stress and remove distractions with the Mindful Reminders Card Deck. These 52 simple, yet powerful practices will help you build skills of awareness, compassion and presence for what matters in your daily life. Whether you are new to mindfulness practice, or whether you’ve been meditating for years, this deck offers fun, accessible reminders for bringing more mindfulness into your life. Chris Willard, Psy.D., is a clinical psychologist, author and international presenter on mindfulness, compassion, self-compassion and positive psychology. www.drchristopherwillard.com.